For centuries, European elder (Sambucus nigra), also known as black elder, has been valued in North America and Europe as a healing remedy. Traditionally, all parts of the plant were used -- the leaves went into making ointments for treating bruises and wounds, the roots were used as a diuretic, the flowers were known for their astringent properties, and the berries were used for rheumatism. Today, elderberries are known primarily for their beneficial effects on the immune system and for relieving symptoms of colds and the flu. Scientific evidence finds elderberries to have powerful anti-inflammatory and antiviral properties. Elderberries are an excellent source of fiber and vitamin A, and they’re high in infection-fighting vitamin C. They also contain iron, potassium, vitamin B6, and beta carotene. Elderberries are packed with flavonols, phenolic acids, and anthocyanins, antioxidant plant compounds that can help reduce damage from oxidative stress in the body and reduce inflammation. One study suggests that elderberry extract could shorten the duration of the flu by up to four days. Another study of 60 people with the flu found that those who took 15 ml of elderberry syrup four times a day showed an improvement in flu symptoms in two to four days, while the control group took seven or eight days to improve. Other research shows that elderberry improved flu symptoms including fever, headache, muscle aches, and nasal congestion after just 24 hours. Elderberries help reduce swelling in mucous membranes like the sinuses to help relieve nasal congestion, making it helpful for both colds and the flu. Elderberries’ potent antioxidant effects may also have a positive impact on heart health. The anthocyanins they contain have been found to decrease the risk of cardiovascular disease, and studies suggest that elderberries may reduce the level of fat in the blood and lower cholesterol. Animal studies find that the polyphenols in elderberries lowered blood pressure, and the animals were less susceptible to organ damage caused by high blood pressure. Elderberry can also increase insulin secretion and improve blood sugar control. Since type 2 diabetes is a risk factor for heart and vascular disease, this is important for preventing these conditions. 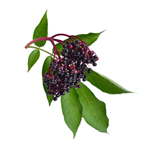 Elderberries are available in a variety of forms, from syrup to gummies and capsules. Look for an elderberry supplement containing organic elderberries that were grown without the use of toxic pesticides, fungicides, or herbicides. When choosing elderberry syrup, opt for a formula that does not contain added sugars. Some doctors recommend avoiding elderberries if you’re pregnant or breastfeeding, so talk to your health care practitioner before taking an elderberry supplement if you’re an expectant or new mom.